Stretching north from the Mull of Kintyre towards Glencoe and east to Loch Lomond, the Cowal peninsula, Argyll offers the very best of rural Scotland in a microcosm. Here you'll find quiet glens, heather-clad mountains, lochs, idyllic islands, charming fishing villages, forest parks, flocks of sheep, Highland cattle and herds of deer on the hillside. Bordered by Loch Fyne on the west and the Firth of Clyde on the east, this long, three-fingered peninsula looks on the map like a lobster's claw. 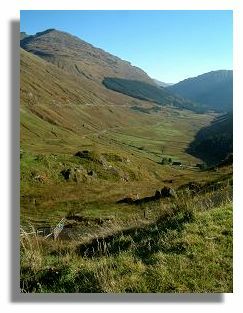 Due to its undulating terrain, there are limited roads south to Tighnabruaich - partially single track roads - but offer spectacular motoring scenery all the way. From Edinburgh and Glasgow the most direct way to get here is from Stirling or the Erskine Bridge, up Loch Lomond, left at Tarbet and over Glen Croe (and pausing at the Rest and Be Thankful - see illustration), south along Loch Fyne to Strachur and then inland through the Glendaruel forest over to the Kyles of Bute. Alternatively, from Glasgow you can take the ferry from Gourock over to Dunoon and then cut across to the other side of the peninsula. Talk about getting away from it all! The McKie family, ex-pat Scots from the south of England, decided to return "home" and took over the Royal Hotel, Tighnabruaich, seven and a half years ago. This quaint Victorian hotel, built in 1847, was at the time, a popular local pub with 20 rooms upstairs, and a property in need of complete renovation. As a hotel, the turnover from the rooms was only £9,000 a year while the cigarette machine made £12,000! Time for a radical refurbishment. Today you will be find a warm, log fire welcome at The Royal, a comfortable, contemporary whitewashed lochside inn for the discerning, international traveller who wants to explore a little bit of the beaten track. Turning some of the old bedrooms into spacious bathrooms, there are now just eleven bedrooms, all en suite and named after local places. 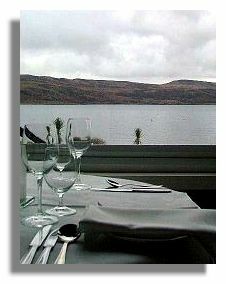 Choose either a Standard or a Superior sea view room - such as Loch Riddon - looking across to the Isle of Bute. This has a huge king size bed with a cosy blanket throw in Black Watch tartan, piles of cushions as well as a sofa, small TV and DVD player which also plays CDs [CD and DVD library available]. If you enjoy music the CD is essential, as your room radio may have very limited reception due to the Highland location. Homely touches include a vase of flowers, hospitality tray, shortbread, fresh fruit and a decanter of something a little stronger. The bathroom is extremely large with a long bath and separate power shower as well as a fabulous old oak dressing table. Huge towelling bathrobes and fine Molton Brown toiletries are supplied. 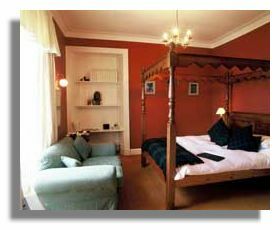 There's a special four-poster bedroom for a touch of old-fashioned romance while Loch Fyne has two gorgeous leather armchairs. Five Standard rooms have a sea view, three with a rear garden view, all freshly and individually designed, decorated in rich tones of red or green and feature a TV and CD player. Every guest will find their preferred room and style of furnishing. In order to prevent the Victorian sash windowpanes rattling in the wind, new double glazed windows are being installed. The McKie family is keen to ensure you feel at home, so you only need to suggest what would make your stay more comfortable. Check for special offers and packages such as St. Valentine's Weekend - which are advertised through the year for special occasions. The Royal is more than just a country inn. This is also a fine restaurant with such a terrific reputation, diners travel from Glasgow to come for lunch. With such excellent seafood, wine cellar and whisky bar, it is more sensible to plan to stay the night! Executive Chef Roger McKie is accompanied in the kitchen by chefs Claire and Louise, his two daughters who are very much part of this family business, along with their mother, Bea. 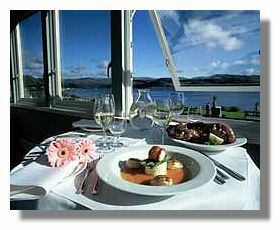 Guests are offered the choice of two distinct Conservatory seaview restaurants - The Deck, offering a casual bistro atmosphere or Crustaceans next door, with white tablecloths, candles and a fine dining setting. However the same a la carte menu is served in both restaurants. Many hotels may claim the food is locally sourced, but at the Royal this is an absolute guarantee. They can name not only the local supplier but also the individual person who has personally caught the fish or hunted the game. Specialities therefore include the freshest fish, lobster, scallops - hand-dived by Mary - langoustine, mussels, oysters, beef and venison, caught by Winston Churchill (a local man, not a politician). Your Hotel Review Scotland reviewer experienced dinner in Crustaceans, beginning the evening in front of the log fire with a G&T and plate of home-made canapés. Before the meal began, a surprise amuse bouche was presented, a delicious frothy and creamy asparagus veloute served in an espresso cup. A basket of home made bread rolls were offered. Then we sampled a large portion of Tighnabruaich Smoked Salmon, which is exclusively smoked for The Royal by a Swiss resident in the village. This has a true smokey flavour, served with red onion caper cream and mock caviar. To follow local lobster, simply boiled and served cold with a green salad, mayonnaise and rather [irresistible] a few homemade chunky fries on the side. You could taste the freshness of that succulent white lobster flesh. Alternatively there is Royal Lobster - the classic Lobster Thermidor. The dessert menu offers something sweet and tempting or Scottish cheese and oatcakes to complete the meal. Lunch is served each day with light snacks, herb bread sandwiches, soups as well as fish and steak for a heartier meal. The various pubs and fireside bars at The Royal are an absolute dream for the weary traveller who may have driven for a few hours along single-track roads to get there. 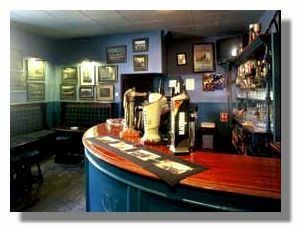 The original Shinty Bar is the village pub and therefore busy with local residents as well as hotel guests. Ask about the happy hour - probably 5- 6pm - for half price drinks. Alternatively for a cosy and relaxing drink there are two separate lounge bars beside the Deck and Crustacean restaurants on either side of reception. Here are log fires, black leather sofas, Black Watch tartan carpets and piles of magazines. It wasn't until the next morning after breakfast that we found, tucked around the corner, a small library and sitting room so forget about rainy days - choose a book, a comfy sofa by the fire and relax. Afternoon tea is served around 4pm in traditional style. Guests at The Royal tend to come here to relax and do very little but just sit and absorb the view and fresh sea air. However there are four golf courses nearby, forest and hill walks with the opportunity for fishing, game shooting, sailing, boat trips, horse riding and painting lessons. Cookery demonstrations are also available at the hotel with Head Chef Claire McKie. New to the hotel from December 2004 is a Beauty Room for a range of face and body treatments. Until now a massage or facial have been available in guest rooms but so popular have they been that a purpose built room has been designed. Otherwise take a day trip to Inveraray Castle and lovely gardens, or take the ferry over to the Isle of Bute and visit Rothesay (with its castle) and Mount Stuart, the ancestral home of the Marquis of Bute. In April/May Bute hosts a Jazz festival and in late August, you can experience the Cowal Highland Gathering. Arriving at the Royal for the first time in the murky late afternoon in December after a long drive from Edinburgh, the glowing log fire and a warm welcome from John the manager/waiter, completely evaporated any feeling of weariness. Guests are sure to feel immediately relaxed and the homely touch - hot water bottles, fresh flowers, CD or DVD player in each bedroom - adds a sense of 5-star luxury. Above all it is the quality of the food and high standard of cuisine which turns this village inn into a very special country house hotel. 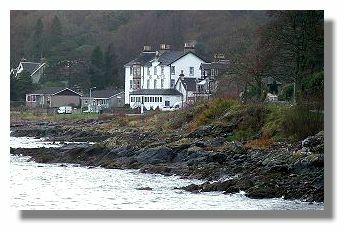 The Royal, Tighnabruaich is a special destination hotel at the end of a single-track road - but it sure is worth the drive. For more information or to make a reservation see the Royal Hotel Web site or e-mail info@royalhotel.org.uk.